When you go years, or even months, without charging anything on your account, don't be surprised if the credit card issuer cancels the account. Your credit card issuer has the legal right to close your credit card account as it deems necessary. And an inactive credit card is often the prime candidate for being closed. Closing your unused credit card gives the card issuer the ability to extend that credit limit to to another borrower. In other words, someone who's going to make charges and incur interest. It's nothing personal; it's just a business decision. Your credit card issuer might let you know in advance that your credit card will be closed. Others close your account first, then send you a letter telling you that it's been closed. Some cardholders don't realize their card has been closed until they try to use it and the card is declined. Unfortunately, having a credit card closed, in some cases, can hurt your credit score. First, having your card closed could increase your overall credit utilization, depending on the balance on all your credit cards. Your credit utilization is the amount of available credit you're using and counts for 30% of your credit score. When a credit card gets closed, that credit limit is no longer considered in your credit utilization. So, if you have balances on all your other credit cards, your utilization increases. For example, if you had a total of $3,000 in credit card debt and a $5,000 total credit limits, limit, your credit utilization would be 60%. If a credit card with a $1,000 limit gets closed, your credit utilization would go up to 75%. A credit utilization that's lower than 10% is ideal, anything above 30% is too much. You can lessen the effect of a closed credit card by paying off some of your credit card debt or by requesting credit limit increases from your other credit card issuers. The card issuer will consider your credit history, time since last increase, current income, and other factors to decide whether to increase your credit limit. If you have a joint credit card, both cardholders' credit history and other factors will be considered. Though it's been widely reported that a closed credit card hurts your credit by shortening your credit age, it's not entirely true, not yet at least. As long as the account appears on your credit report, it's still factored into your credit score. It's not until the account drops off your credit report (in about 10 years) that your credit age could be affected - particularly if it's your oldest credit card. If you find out your credit card is being canceled because of inactivity and it's a card you want to keep open, call your credit card issuer and request to keep it open. Offer to make a purchase on that account immediately in exchange for having it reopened. You may not be able to convince the issuer to reopen a closed credit card, but you may be able to have the credit limit moved to another credit card with that same issuer, if you have one. While that won't eliminate credit score losses due to a shorter credit age, it will help you in the credit utilization area. There's not a standard inactivity time limit so it's to predict when a credit card issuer would close your credit card. It could be six months, one year, two years or more. 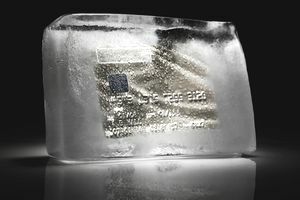 You can prevent inactivity cancellations by using your credit card periodically. Make a small charge on your credit card every two to three months and pay the balance in full when you receive the statement. That way you keep your credit card open and active and your balance paid off.